We’re really pleased to be able to announce the release of a free module for Magento today: the rather catchily named “Filter Magento payment options by shipping address” module. Peacock Carter have developed a Magento’s module to allow you to filter the payment options available by shipping address (what we’d call “delivery address” in the UK! ); This module allows you to restrict how a customer pays by country. The module is available for free download and use from our Github account. A Magento Enterprise client based in the Middle East required that the “Cash on delivery” payment method be made available to any billing address but limited to just one shipping country. Cash on delivery is a very popular payment method in the Middle East. Cash on delivery operates as you would expect: you check out from your Magento store as usual, selecting “Cash on delivery” as your payment method (rather than delivery method). A courier then delivers your purchases, and collects payment for the order at the same time. 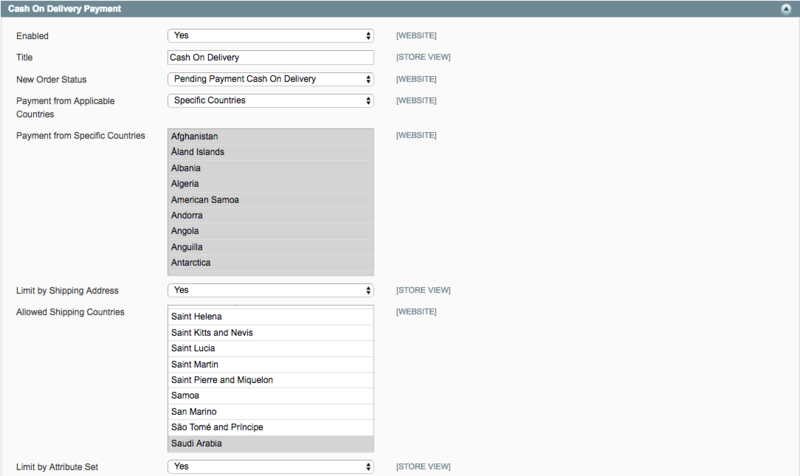 Our Magento client only wanted to offer this option in the UAE, and none of the surrounding countries they operate in. The client’s website sells computer games and a large proportion of their clients are under 18 years old, and don’t have their own credit cards. Our client found that this customer group would therefore often use their parents’ work address as the billing address, and this meant that the payment address was often outside the UAE itself. The development of the Magento module allows the client to control which payment methods are displayed for which products, and is tested on Magento Community versions 1.9.0.1+ and Magento Enterprise 1.14.0.1+.